The Global Volcanism Program has no activity reports for St. Michael. The Global Volcanism Program has no Weekly Reports available for St. Michael. The Global Volcanism Program has no Bulletin Reports available for St. Michael. The St. Michael volcanic field, at the south end of Norton Sound, covers all of St. Michael and Stuart Islands with more than 55 cones and craters. Broad low shield volcanoes underlie the younger cones, and maar volcanoes are located at the SW part of the volcanic field, which covers over 3000 km2 and extends inland along the Golsovia and Kogok rivers. The youngest activity is of Holocene age, and native tradition says that a village was submerged by lava three times. Moffit F H, 1905. The Fairhaven gold placers, Seward, Alaska. U S Geol Surv Bull, 247: 34. The Global Volcanism Program is not aware of any Holocene eruptions from St. Michael. If this volcano has had large eruptions (VEI >= 4) prior to 10,000 years ago, information might be found on the St. Michael page in the LaMEVE (Large Magnitude Explosive Volcanic Eruptions) database, a part of the Volcano Global Risk Identification and Analysis Project (VOGRIPA). There is no Deformation History data available for St. Michael. There is no Emissions History data available for St. Michael. 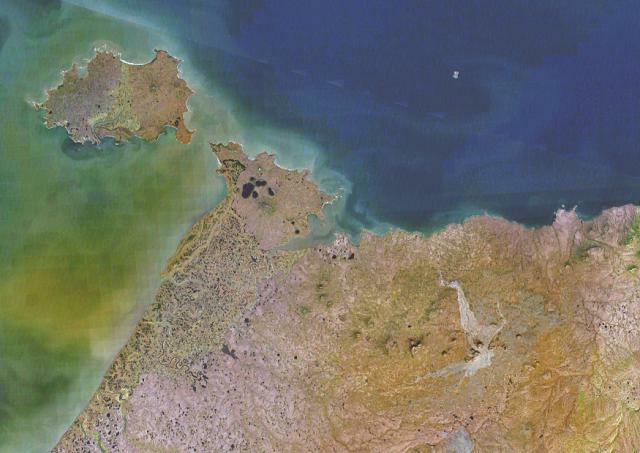 The St. Michael volcanic field consists of more than 55 cones and craters occupying Stuart Island (upper left), St. Michael Island (forming the apparent peninsula at left-center, and areas inland. Broad low shield volcanoes underlie the younger cones, and maar volcanoes are located at the SW part of the volcanic field, which covers >3000 sq km. Light-colored young lava flows can be seen at the lower right originating from "The Sisters" area. Native tradition says that a village was submerged by lava three times. There are no samples for St. Michael in the Smithsonian's NMNH Department of Mineral Sciences Rock and Ore collection. Large Eruptions of St. Michael Information about large Quaternary eruptions (VEI >= 4) is cataloged in the Large Magnitude Explosive Volcanic Eruptions (LaMEVE) database of the Volcano Global Risk Identification and Analysis Project (VOGRIPA).